I try to keep members updated about the general goings-on at the farm, but things have been so hectic I haven't had time this year. The wet weather has really set us back - we're just now getting the potatoes hilled (and those of you doing farm pick up probably saw my parents and I working on this Sunday afternoon). Though we have flats of summer squash started and doing well, ready to flower in fact, we haven't been able to get them in the ground yet. 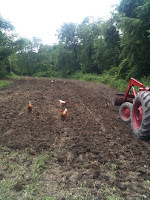 In addition to the new 6,000-ish square feet for the potato/onion/shallot field we also plowed about 8,000 square feet behind the main barn. This area is for all our winter and summer squash, melons, and second and third cucumber plantings... 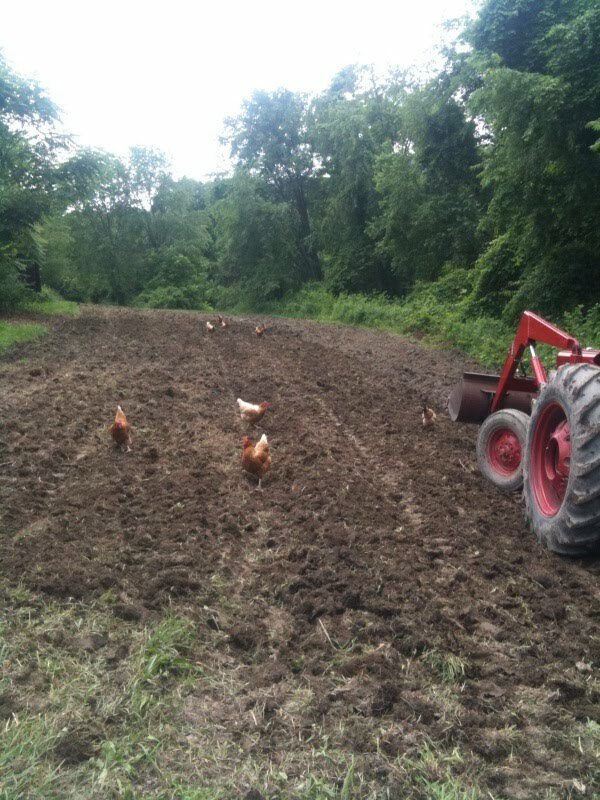 Though we'll only plant about 5,000 sq feet this year and cover crop the rest. A twice-broken tractor (recently repaired) and wet weather really set this project behind, but it should be ready to plant on Wednesday - as long as we don't get a soaking before then. About an inch of rain per week is all we need and as you know it's been well over that. So we definitely anticipate tons of our great varieties of summer squash and melons, they just might be a few weeks later. This weather also makes for perfect conditions for many diseases to thrive and spread - including the late blight which has unfortunately already been reported in the area. I am staying ahead of the game this year and treated the tomatoes with an organic copper solution last week, and we plan to schedule this or similar treatments regularly through the season. Treatment essentially involves carefully misting each leaf of the plant, giving all surfaces even coverage. It's certainly labor intensive but I am determined to do everything I can to (safely) avoid the heartbreak and disappointment we experienced last year as a result of this blight. The blight can impact other crops in the nightshade family, so we will treat the potatoes as well. As you've noticed on some of the greens, we're having a few insect issues this spring. They really did a number on the chard and tatsoi, and started in on the pak choy as well. We're treating mainly by using row covers, hand-picking and applying diatomaceous earth - a chemical-free mechanical pest control. We're also hoping to cut down on this pest population by not planting any more of these susceptible crops until the fall. Instead of seeding or cutting more of these dark greens for early summer harvest, we will tear them out and seed things like more carrots, beets and eventually turnips and parsnips. Insect control and our IPM (integrated pest management) plan is a big part of why we practice crop rotation - the same crops won't be planted in these beds or fields for at least 3 years, not only to give the soil a rest but to thwart these insects. You also probably noticed that your bunches of spinach were on the small side this week. We had very poor germination with our spinach crops and by the time the problem was apparent it was too late to seed more. Look for more spinach in the fall, and in the meantime you can substitute the tatsoi and chard! You would have carrots in your shares by now but our entire first seeding failed and we're still not sure why. The successive seedings of carrots (three as of today) are doing well, so that's certainly good news. You will see carrots throughout the season since we continue these successive seedings through fall. Another crop you'll see a lot of, but a bit later than usual, are bush beans. The wet weather a few weeks ago rotted off the newly emerged seedlings of all three of our bean varieties. This isn't a huge setback, since we reseeded right away and those seem to be doing well, so that only puts us about two weeks behind. We'll do a second seeding of these soon for a late summer crop. In addition to bush beans, this year for the first time we're trying pole beans - a delicious, sweet-right-off-the-vine variety called Rattlesnake. move over basil, hello chard!